Aquarelle runs deep within the lines of her. She breathes cerulean. . . Floating transparent, in the tides of time. 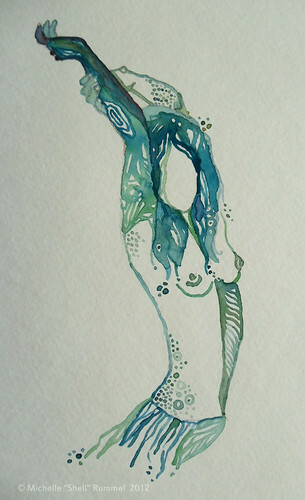 “She Breathes Cerulean”, original watercolor and poem by Michelle “Shell” Rummel. © Shell Rummel, of Shell Artistree. Designs and collections: Shell Rummel Fine Art & Licensing. Write a poem of your own, based on the painting by Rummel, or the phrase “within the lines of her.” Post on your blog and link to us (we love that), or just drop your poems here in the comment box. Buy a year of Every Day Poems, just $5.99— Read a poem a day, become a better poet. In July we’ll be exploring the theme The Cento. Lovely to see Shell’s artwork here. shell is an awesome artist…and good people too…. within the lines of her palm. between thumb and index finger. or double up like soul mates. a lover’s shield, her Girdle of Venus. This is so lovely…It is always an honor to share my art and it’s particularly fulfilling when it is with the Poetry/writing community. Really enjoying the poetry that is being shared here, perhaps inspired by my brushstrokes/words. 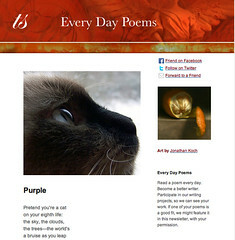 Warm thanks to Tspoetry for the beautiful feature…Such a pleasure! Thanks so much, Maureen, for always being so supportive of my art, my path. I appreciate that you thought to include me here. Your poem, Palm Reading, gave me goosebumps, but then again, your words often do. I know a thing or two about edges and lines…For me there is strong resonance within the lines of your words and I hope you will understand if I hold this one close. Smiles to you, dear Brian, for standing by my side…such a solid friend you are to many. Your words, consistent, real and raw, always mean so much. And Jon, you’re name is new to me, but I can tell you that I loved what you wrote, particularly the second poem which is filled with beautiful, vivid imagery that speaks so deeply to me [sighing sea softly sighing]…I love the way it sounds when read aloud. Just wonderful. Shell you make me blush, thank you for the compliment. The painting is quite lovely. You made me feel the sea in all parts of her. That detail of the hand is just so wonderful. The poems, in like the sea. Love. How fitting that I have been seaside…Just now, back home and enjoying so much, what each of you see… Thank you, again, for this lovely opportunity to share my art. In a forgotten corner of my heart. Placed precisely in the center of your painting. Thanks so much, Shell. I’m glad you enjoyed my poem. I love the sound of Cerulean Blue.